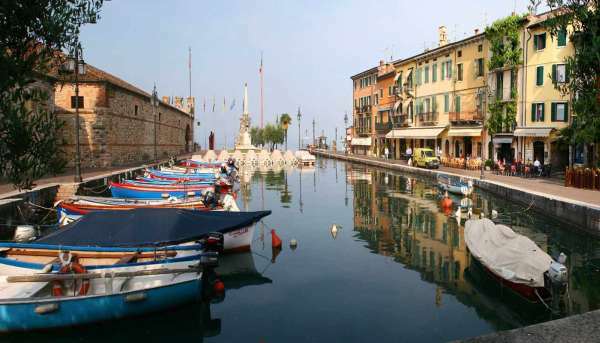 Lazise, one of the most popular towns on the Verona shores, again with a labyrinth of small roads in the historical centre, a beautiful lakeside promenade paved with geometrical mosaics and a huge square paved with porphyry slabs. Pretty little shops enliven this enchanting medieval pearl with its Scaligeri castle in the grounds of Villa Bernini park but which unfortunately is privately owned and not open to the public. However you can visit the tiny Chiesa di S. Nicolò, dating from the XII century, where you can still admire the precious XIII-century frescos attributed to the Giotto school.